As we write, March Madness is winding down (way to go, Gamecocks! ), but we’ve decided to extend the madness into April with Madras Madness! We love madras. For us, nothing heralds the coming of warm weather better than clothes made from these light, bright cotton plaids. Authentic madras cloth is hand woven in India from short-staple cotton, so the finished fabric will always bear some slight imperfections, including “slubs,” thick spots in the thread that give it a unique, hand-crafted texture. The natural vegetable dyes bleed when washed, giving each piece of fabric a unique, one-of-a-kind look. Madras cloth was introduced from India to the European market in the 17th century and became popular for its breathable, lightweight character. It became popular in America for sport shirts and other garments in the middle of the 20th century. 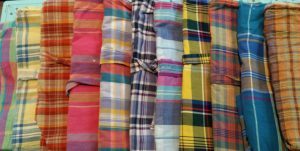 We scour our local sources year-round for beautiful examples of madras and other cotton plaids. They play well with other fabrics and patterns. We especially like pairing them with seersucker for our reversible ties. A madras bowtie will look great dressed down or dressed up, equally at home with jeans, khakis, a navy blazer or a light summer suit. We can’t imagine a better choice for an afternoon wedding party, Easter Sunday or a day at the races. So give madras a try as a tie this spring. Heck, at just $25 each, you can get several to mix and match with outfits as long as the hot weather lasts. 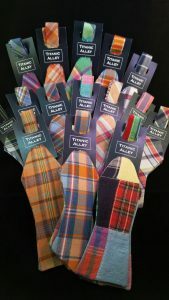 Keep checking the site, as we’ll be adding more one-of-a-kind madras ties throughout the month of April. Get ready for Madras Madness and go a little mad(ras) with us! Click here to browse our selection of madras ties. Titanic Alley bow ties are adjustable from 14" to 18". Free local pickup or delivery in Columbia, SC. Flat rate $7 shipping (USPS Priority Mail) in the United States. Please inquire for orders outside the U.S. Happy Holidays from Titanic Alley! Happy Father’s Day! June 18. Museum ties come home, plus new ties for spring!